In his extended Insider’s video, Mike provides the most in-depth round up and technical analysis he has done all year. You’ll see the big picture: all the reasons Mike is still buying gold and silver, how Silk Road countries are impacting demand, and what precious metals investors can expect in 2017 and beyond. Mike also provides a full wrap-up of the Commitment of Traders (COT) reports and Fibonacci analysis to look for any indication of support in gold and silver prices. Hint: Mike sees big buying opportunities coming up. Be sure to check out Mike’s Hidden Secrets of Money website at https://www.hiddensecretsofmoney.com/. Mike Maloney’s goal for this educational series of videos is to explain and teach in an easy to understand way why you should be investing in gold and silver. In these videos Mike breaks it down to easy-to-follow analogies, real pages from history, and animations that tie it all together. Mile is the bestselling author of the Guide to Investing in Gold & Silver. Mike Maloney was also Robert Kiyosaki’s precious metals expert in the Rich Dad series. His own book in the Rich Dad Series is called: As Mike explains in the series and his book, we live in an economic system that is made complicated by design. Basically, it’s set up so most people don’t even try to understand it. In Mike’s videos, he breaks down these concepts using easy-to-follow analogies, real pages from history, and animations that tie it all together. 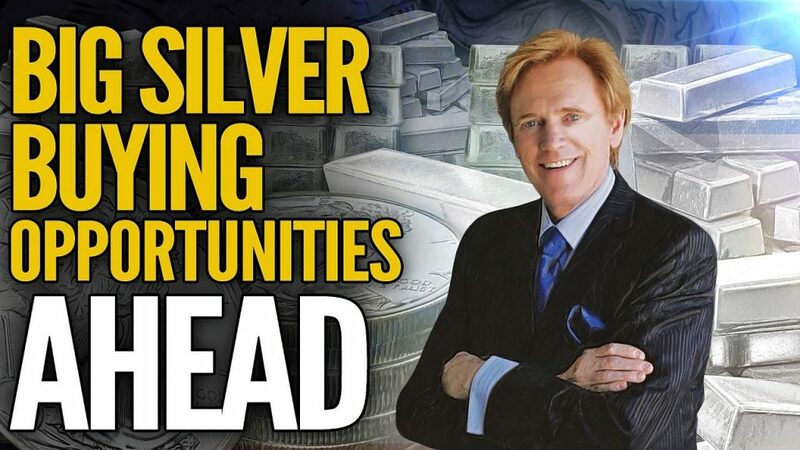 Mike Maloney is also the founder of GoldSilver.com which was one of the first websites ever to sell bullion online. Hey Mike, thnx for this analysis and everything else you produced to inform about money and currency. But I was wondering why you put in those Fibonacci lines? I know about Fibonacci but what do they have to do with this? Why bitcoin is a superior form of currency and money than gold/silver. We can agree that the current worldwide system of a centrally bank controlled currency, the fiat currency, is doomed to fail, be that the Yen, Yuan, Euro, USD, Venezuelan Bolivar, etc. Those of us aware of this are scrambling to find the alternative particularly after 2008. After watching Mike Maloney videos I am noticing we are divided into two camps. There are those who think we should go back to using the gold standard like Ron Paul, and even better, just plain old physical gold and silver coins as currency and on the other side, the crypto-technocrats like me who are capable of understanding the potential of cryptography and P2P networks in how they can save us and solve this problem. I can see that the gold bugs are very correct in their understanding of the global financial problem and that they can see the eventual implosion of the global economic catastrophe of finance and monetary supply. I for once supremely enjoyed Mike Maloney’s videos in this regard. – Gold (and more so silver), has an intrinsic value of utility. Its scarcity or supply might be affected by its uses other than currency, like in jewelry, electronics, etc. Bitcoin being totally virtual cannot have any other use except as currency. – The amount of gold on Earth in existence is not known. A huge mine, or cache might be discovered that completely overwhelms the supply and shocks the proposed monetary system based on gold because it will immediately cause inflation by the excess of discovered gold. (That actually happened when Spain discovered all the new gold and silver mines in America). – Gold can be artificially manufactured. Granted, currently it is an extremely expensive exercise but IT IS possible. Who knows, tech can develop to make the process simple, even trivial. Excess bitcoins cannot be artificially created. It is mathematically impossible. – Gold and silver is completely divisible, but requires exact measurements for practical use (fine scales, etc) so at tiny amounts a certification from a central and trusted authority is a practical necessity. This, needless to say introduces a lot of problems. Divisibility in bitcoin is trivial in comparison, since it is simply digital. One can divide bitcoin to 10 decimal places right now. Mathematically of course, bitcoin could be divided to infinity. – Gold is portable, but it nowhere compares to the portability of bitcoin. Bitcoin can be moved by the billions, walking across the border or sent via SMS, just by memorizing a series of words. Try traveling to the US or anywhere with 10 gold coins. – Gold is a store of value like bitcoin. But the costs of storing gold goes up as more gold is physically stored, either personally like in home or through a third party (yikes). Again storing billions of dollars worth in bitcoin is trivial – likewise just memorize a series of words and presto. – Gold is currently held in reserve by many countries, and are in fact increasing alarmingly their reserves in this right now, where as bitcoin is practically being ignored by these very same countries. This gives bitcoin an additionally huge potential for increasing in value as a reserve currency. The minute a country say, Iceland, adopts bitcoin as a reserve currency (not even day to day national currency), its price is going to explode exponentially. Not so with gold. – The higher the price of gold goes up, more resources will be naturally spent in mining gold and more gold will be physically extracted and put in circulation. This logically lowers the expectation in gold as a store of value. This cannot happen in bitcoin no matter how much money is spent in mining it, because the supply is rigidly fixed. Miners in bitcoin only compete between each other and the supply is always known. – Authenticating gold requires either a central authority to do so (minting), or having your own touchstone or chemical analysis kit, which in practice is very burdensome. Authenticating bitcoins is trivial in comparison, just have a full node running in your computer. – Bitcoin requires knowledge of the protocol, storing of passwords, a secure computer, etc, which is very complicated. Actually not. Depending on the amount of bitcoin you wish to “store” it can be very simple. Just inform yourself a bit and storing bitcoins becomes many magnitudes safer than storing physical gold or silver. – Bitcoin requires an Internet or alternative P2P network to operate, where as gold does not. But think about this for a second. If the world goes into a dark age where the INTERNET is gone, we are done already as a civilization anyway. In that case better hoard guns and munition (and even medical supplies) than gold. – The blockchain could be undermined by a superiorly hardware armed and determined attacker like the NSA, or China or some other totalitarian government. There are many ways to counter this, including the use of checkpoints in the blockchain, isolating bad actors from the network, etc. – Governments will simply ban cryptocurrencies. They can (and have and will), but in the face of the alternative (hyperinflation, bad monetary choices, outrageous bank bailouts), ordinary people will still resort to using bitcoin as a currency. Bitcoin not having a central point of censorship or control cannot be stopped. You only need to see that the P2P BitTorrent protocol to see this is true. (unless we have totalitarian regimen like North Korea, in which case, the argument becomes moot, massive rebellion is in order instead). Besides it is easier for totalitarian governments (and even not so outright repressive ones like India) to confiscate gold than to “confiscate” bitcoins!